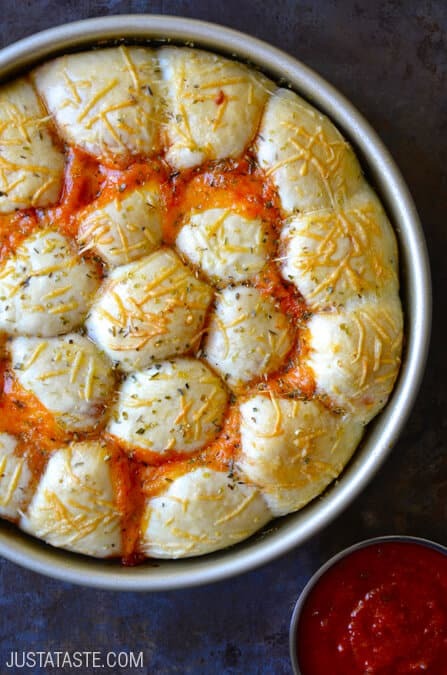 Pizza dough, marinara sauce and cheese have morphed into many iterations on this site, from Pepperoni Pizza Pull-Apart Bread to Homemade Focaccia Bread Pizza. 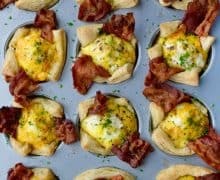 But the latest iteration skips the slice entirely in favor of a finger-friendly alternative: Cheese and Pepperoni Pizza Bites. 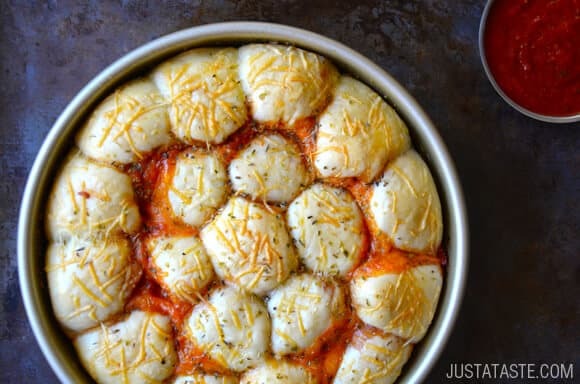 Imagine pockets of pizza dough stuffed with marinara sauce, shredded mozzarella cheese and pepperoni, which are then pinched closed, topped with Parmesan cheese, and baked until golden brown and bubbly. 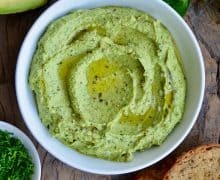 And this recipe can be as homemade or as store-bought as you desire, from the pizza dough to the marinara sauce to the creative combinations of toppings-slash-fillings. 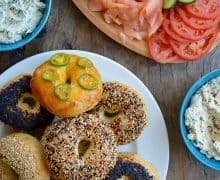 Hosting a football-watching party? Searching for after-school snacks? Needing a late-night bite? Cheese and Pepperoni Pizza Bites have you covered. 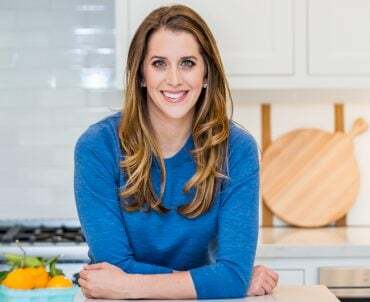 Preheat the oven to 375ºF. Grease a 9-inch cake pan with cooking spray. Lightly flour your work surface then divide the dough into 19 equal portions. 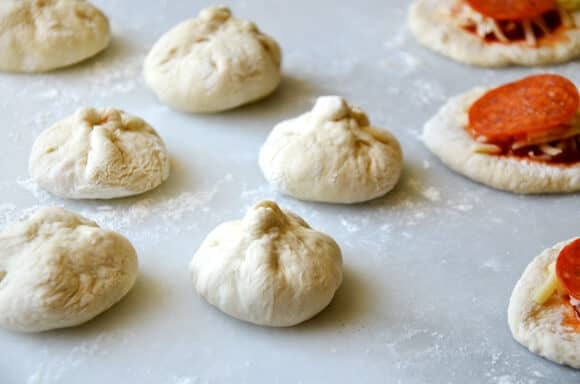 Roll each piece of dough into a small circle about 3 inches in size. 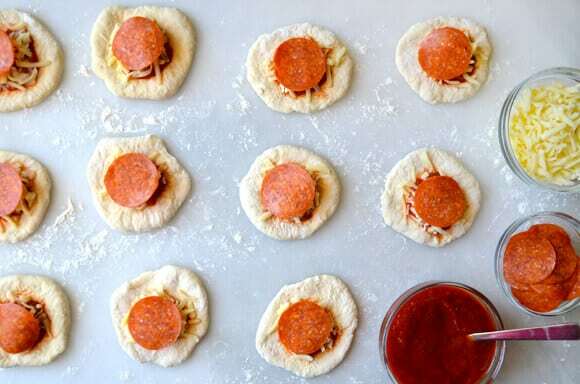 Add 1 to 2 teaspoons of marinara sauce into the center of each piece of dough then sprinkle the marinara with a small portion of the cheese and one slice of pepperoni. Pull all of the sides up to meet in the center, firmly pinching to seal the fillings inside the dough pocket. Repeat the filling and sealing process with the remaining pieces of dough. In a small bowl, whisk together the egg with 1 tablespoon water. 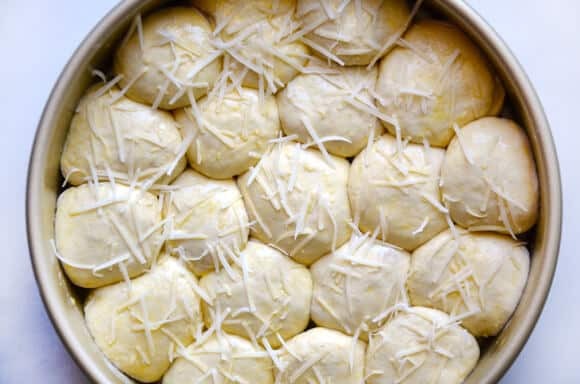 Brush the eggwash all over the tops of the dough balls then sprinkle the Parmesan cheese on top. 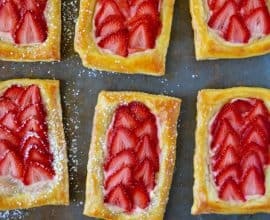 Bake for 25 to 27 minutes until golden brown and bubbly. (You can check if the dough is fully baked by lifting one piece to see if the bottom has browned slightly.) Remove the pizza bites from the oven, sprinkle the tops with the dried oregano and serve with additional marinara sauce for dipping. 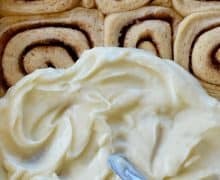 It's important to roll each piece dough out to 3 inches in diameter so that the dough is thin enough to bake completely during the specified time. Pizza dough is much easier to roll out when it's at room temperature than when it's cold. 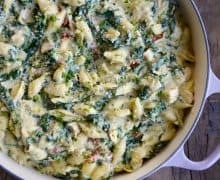 Recipe by Kelly Senyei of Just a Taste. Please do not reprint or repost this recipe without my permission. 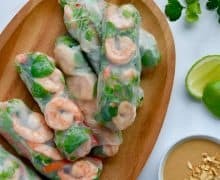 If you'd like to feature this recipe on your site, please rewrite the method of preparation and link to this post as the original source.